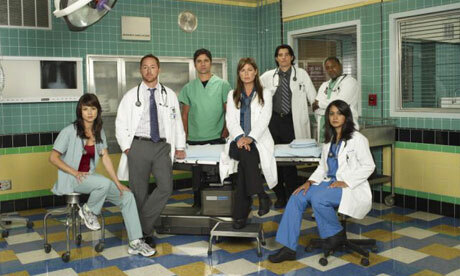 This week after 15 seasons and 330 episodes ER closes up shop. I have never seen an episode of ER so I'm not the best person to eulogize the show. From the looks of the picture it was about doctors or maybe butchers with stethoscopes. Starring the cute girl from Newsradio, the girl who could Bend it Like Beckham, Eminems manager from 8 Mile, Uncle Jesse and a guy who sort of looks like Seth Green it carved out a piece of the television landscape for years. I mean it was on for 15 years so it must have been pretty good. With any long running show there are great moments and episodes that live on in history. Who could forget the contest on Seinfeld, Diane leaving Sam on Cheers or Ross and Rachel on a break on Friends. These were all shows that like ER were on NBC on Thursdays. I'm sure there are similar moments on ER but by 10 PM the PVR (and earlier the VHS tape) was full of entertainment. You gotta leave time for a book. It was the show that made George Clooney famous and spawned millions of men and lesbians to recreate his Caesar haircut. A haircut which had been out of fashion for 2000 years and had only been seen on Shakeperean stages. I almost forgot about that and that's pretty groundbreaking. So we say farewell to ER. For some like any loss it will be hard to adjust to life without it. Others will be surprised that it was still on. A Red Eye For Canada? Ron Paul in the new Bruno movie?